Here are two ways to invest in travel with complete peace of mind. The accommodation, transport and activity suppliers that we recommend meet strict quality controls but should any supplier become insolvent and fail to provide the accommodation, transport or activity we booked for you, our supplier default insurance protects the money you paid for that service. This financial protection does not extend to any aspect of your safari that you didn’t book through us. This is one of the important advantages of working with independent experts, like us. View our handy infographic. 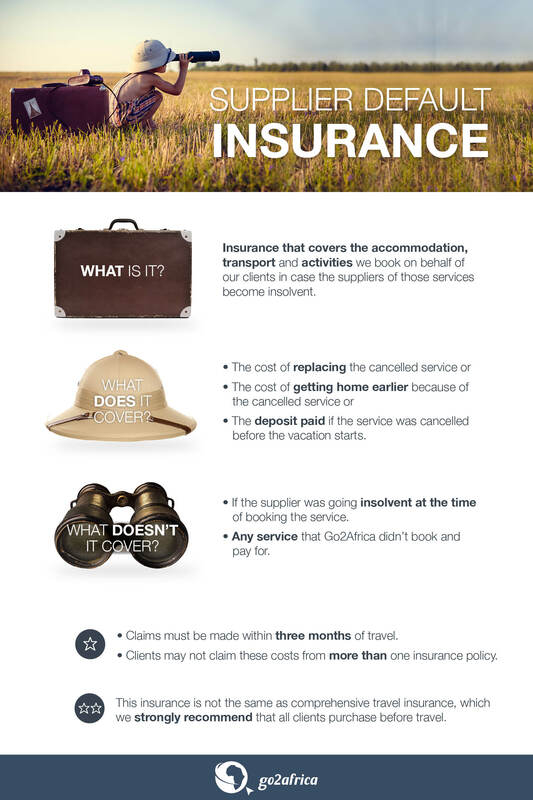 Our supplier default insurance is not the same as your travel insurance. You need travel insurance to protect yourself against cancellation fees and curtailment costs should an unexpected event stop you from travelling or cut your vacation short. Automatic travel insurance is offered by most major credit cards but we recommend that you always confirm this with your card issuer. We consider medical emergency travel insurance essential to your peace of mind on safari –something you should never leave home without. At Go2Africa we understand that security and safety are of paramount importance to you. We partner with one of the world’s largest payment providers and are able to seamlessly accept credit card payments from over 135 countries.